Cytochrome P450 3A4 (top) bound to erythromycin (bottom). If you have a headache and take a drug to block the pain, you'll notice that the effects of the drug wear off in a few hours. This happens because you have a powerful detoxification system that finds unusual chemicals, like drugs, and flushes them out of your body. This system fights all sorts of unpleasant chemicals that we eat and breathe, including drugs, poisonous compounds in plants, carcinogens formed during cooking, and environmental pollutants. The cytochrome p450 enzymes are our first line of defense in this chemical battle. The cytochrome p450 enzymes find unusual molecules and add oxygen atoms to them. In most cases, this has the effect of making the molecule more soluble in water, and thus, easier to flush out of the body. The added oxygen also provides a ready handle for other detoxifying enzymes to take hold and further modify, and destroy, these toxic molecules. This task of adding oxygen is chemically tricky, and cytochrome p450 enzymes use a powerful molecular tool to perform the reaction: an iron atom in a heme group (described in more detail later). Cytochrome p450 enzymes are found in all organisms. Each organism builds several different enzymes, each of which act on a different selection of molecules. Typically, bacteria make about 20 different forms of these enzymes and we produce about 60. Plants often make hundreds of different forms. This is because plants make unusual pigments and exotic toxins to protect themselves. Many of the reactions needed to make these molecules are performed by specialized cytochrome p450 enzymes. For more information on cytochrome p450 from a genomics persective, take a look at the Protein of the Month at the European Bioinformatics Institute. The molecule shown here is CYP3A4 (PDB entries 1w0e and 2j0d ), the cytochrome p450 that plays the major role in drug detoxification in your body. It has been estimated that this enzyme acts on about half of known drugs. For instance, it modifies the antibiotic erythromycin, shown at the bottom in blue. It also detoxifies such diverse drugs as codeine, diazepam (Valium), paclitaxel (Taxol), and several anti-HIV drugs. In some cases, however, the reaction performed by cytochrome p450 enzymes can cause more harm than good. For example, CYP3A4 is partially responsible for the toxicity of large doses of acetaminophen (Tylenol). The modified form of acetaminophen is dangerously reactive, but it is normally cleared away quickly by other detoxifying enzymes. But with large doses, the reactive intermediate can build up to dangerous levels. Doctors must be careful to keep the cytochrome p450 enzymes in mind when they prescribe medications. For instance, you may have seen warnings on prescriptions, telling you not to drink grapefruit juice when taking a medication. Grapefruits contain a flavinol molecule that inhibits cytochrome p450 enzymes. This will slow down the detoxification of drugs, which may cause them to have stronger effects than expected by the doctor. Cytochrome P450 14alpha-sterol demethylase (left) and NADPH:adrenodoxin reductase with adrenodoxin (right). Cytochrome p450 enzymes also play a number of essential roles in the synthesis of normal cellular compounds. For instance, special cytochrome p450 enzymes are built to perform chemical steps in the construction of steroids, vitamins A and D, and lipid-like eicosanoid molecules involved in signaling. The enzyme shown here on the left is a fungal cytochrome p450 that performs a step in sterol synthesis (PDB entry 1ea1 ). A similar enzyme in our cells is needed for the synthesis of cholesterol. The enzyme complex on the right provides electrons for the reaction (PDB entry 1e6e ). The best-studied cytochrome p450 enzyme is a bacterial enzyme that adds oxygen to camphor. 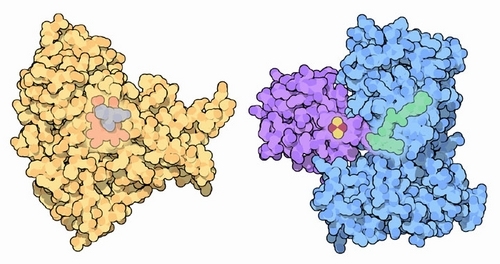 Two early examples of these enzymes, called cytochrome p450cams, are shown here. On the left (PDB entry 3cpp ) is a structure with camphor and carbon monoxide bound in the active site. The carbon monoxide is an inhibitor that poisons the enzyme. It binds to the iron (large yellowish sphere in the middle of the heme) in the same place as oxygen gas. The cysteine amino acid at the bottom activates the iron. The structure on the right (PDB entry 1noo ) shows camphor after the reaction, when an oxygen atom has been added (the other oxygen atom is released during the reaction as a water molecule). Looking through the PDB, you can find dozens of other structures of cytochrome p450cam, showing many different molecules bound in the small active site, and showing many different stages in the reaction. These illustrations were created with RasMol. You can create similar pictures by clicking on the accession codes here and picking one of the options for 3D viewing. F. P. Guengerich (2001) Common and Uncommon Cytochrome p450 Reactions Related to Metabolism and Chemical Toxicity. Chemical Research in Toxicology 14, 611-650. P. Anzenbacher and E. Anzenbacherova (2001) Cytochromes p450 and Metabolism of Xenobiotics. Cellular and Molecular Life Sciences 58, 737-747.